Gal in the Middle: Ain't Itchin' Anymore! I swear...no other pictures exist of you on my computer!!! I deleted them, remember! This bed bug-thing is out of control! LittleD did a church retreat last week and was freaking out about staying in a hotel because they might be there! The eggs look like so much fun! I'm jealous! Hi! 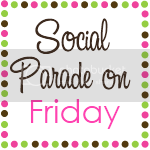 New follower here from Social Parade! Hope you'll stop by and follow back! I'm looking forward to your posts! http://www.frugalinvitation.com/ P.S. I think your last 2 posts are making me itch now too!